We’ve been lucky enough to get our hands on this handheld wonder a few times now. Germany, London and thanks to the recent PlayStation Access event, Manchester. The most recent demo showed off some platforming and gunplay, both of which feel instinctively ace. 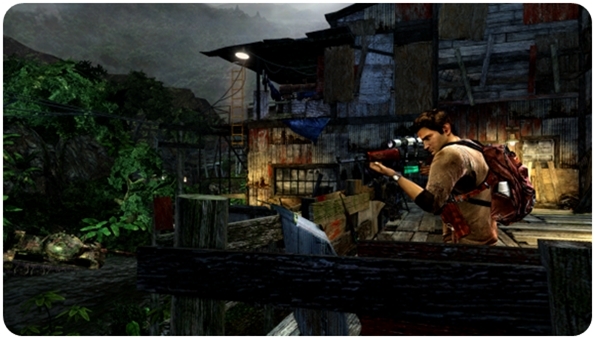 Presuming you’ve played the Uncharted games before, you’ll find the format familiar and undiluted. Gameplay staples include third-person shooting, brawling, puzzles and clambering around precarious environments. Escaping a burning building showed how platforming and climbing works the same as before, but with a few extra innovations that take advantage of the PS Vita’s unique control options. For example, when shimmying along a series of handheld ledges you can use the touchscreen to draw the route ahead. Ledges are conveniently painted yellow, so they’re easy to spot. Just wipe your finger across the line of them ahead and Drake will follow, even to the extent of swinging over jumps. I thought it would be a gimmick I’d quickly tire of, but it’s so reliable and it’s enjoyable spotting the route, swiping it and watching Drake move while your scan your surroundings for hidden items. Yes, it’s automated, but when you think about it, the climbing in Uncharted is relatively risk-free anyway. Most elements of gunplay are the same as the console versions. There are a few changes, such as reloading your gun and picking up weapons/ammo by tapping the screen. Hopefully we’ll have the option of using a button to reload as the screen-tap doesn’t feel right when you’re busy adjusting the camera and moving around. Another touchscreen element involves using the new machete item to cut through fabric barriers by following onscreen directional swipes. You swipe three times and then Drake follows suit. It would have looked better if he responded to each swipe individually to be honest. What works much better though is the motion-control for aiming your sniper scope which I used to provide long-range support to the AI partner. This has been significantly improved since I last tried it a few months ago. You can still use the analogue stick, which works well for moving great distances, but I found subtle movements of the Vita worked brilliantly for lining up a headshot. The sensitivity balance is just right. The game is prequel to the original title, Uncharted: Drake’s Fortune, so we’d imagine familiar characters will be limited to Sully. We can tell you that Drake is running around with a girl that isn’t Elena or Chloe. The big man-whore. If you’ve been devouring the screenshots and trailers you’ll already know that visually the game is very close to its PS3 counterparts, essentially smashing the barriers that handhelds are supposed to conform to. Industry analysts (aka crystal ball groping prats) are always harping on about full-price games being a dying breed thanks to ultra-cheap mobile phone games. 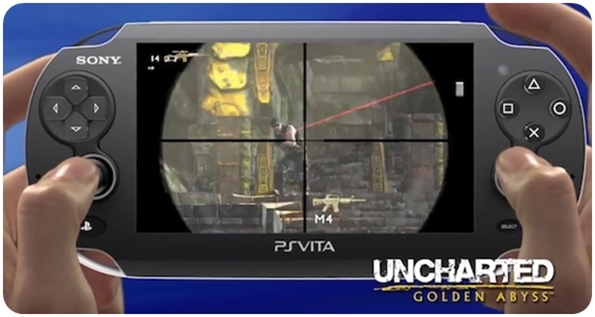 Hopefully the Vita will be able to prove them wrong, despite the slow start in Japan. If third-party developers can extract titles of a similar quality too then we should be laughing.